A Great Customers Renegade Toyhauler! We have been servicing customers at the same location since 2003. Our owners and staff have been in the RV industry for more than 20 years and we pass that experience and knowledge on too our customers. What sets our repair shop aside from a dealership is that we strive to offer the best customer service possible, as well as educate our customers about their RV's, the maintenance, and optional upgrades that will help them keep their RV's in great condition and worry free. We take pride in our work and treat the repairs as if they were on our own RV's. There is no job too big or too small. Customers are always asking us what type of repairs we do? Our Motto is "We do everything from cleaning toilets to complete remodels"! Below is a list some of the services that we offer. Thank you for taking care of my RV; you have a great team! We had a great experience at California RV. We recently had the front cap replaced on our toy hauler. They did a good job and in a timely manor too!! The kindest, most helpful experts on RV repairs that we’ve found. Thank you. California RV Specialists is the only place to take your RV. They do quality work and are caring and competent and honest! We just purchased a new used 5th wheel and took it there to be inspected and solar panel installed. We are very pleased with the service we received. The staff is awesome!! Great atmosphere, amazing customer service and VERY knowledgeable about RVs and RV life. I wouldn’t take mine any where else!! 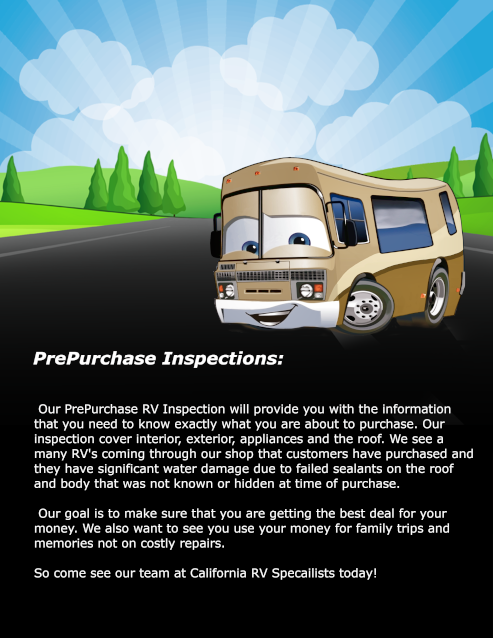 If you have an RV this is the place for maintenance, check ups and repairs! Very knowledgeable, friendly, reasonably priced, etc. Dustin is a wealth of knowledge! Dustin and his team are wonderful. We have been taking our trailer to them for years and have always done wonderful work. They are upfront and honost. We would recommend them to everyone that needs any type of service for their RV or trailer. California RV Specialists saved us when a renter damaged our Toy Hauler recently. Very helpful and quick turnaround on getting it fixed for us. We recommend them highly! We can not say enough about how great California RV Specialist are, they recently removed our dinette and replaced with a recliner/love seat. They did a outstanding and amazing job. We dreamed about how great it would be and they delivered. We HIGHLY recommend them. They are the best. Thank you so much!!!! These folks are so very nice they know what they are talking about, and are affordable. Great customer service, no pressure sales!! Got all the gear we need for our new travel trailer. Extremely Unprofessional. The owner Dustin is a complete jerk. There constant excuse for not doing what they say they will is they are super busy. As if everyone is not busy. Scott led me on for 3 weeks that he would get a parts list sent to forest river and it still has not happened. You call them and it's hard to even have someone answer he phone. When I finally got ahold of Dustin to tell him of all these issues (because he had no clue). He said find someone else then and hung up on me. REAL PROFESSIONAL!!!! They have been absolutely terrible. I will be letting forest river know of there customer service. These guys should not even be doing business. If I was a betting man I would bet Dustin goes out of business again like he did before. Don't trust these guys. Consumer beware. Our motorhome had water damage into the overhead bed, Dustin kept us updated of progress as the job went along, did quality work with a fair price. We trust his work explicitly and highly recommend his service. I've had nothing but good experiences with California RV. A great family owned business with Christian values. They truly care about you and the community. I was so impressed with the service that I got I will not take my RV anywhere else. Dustin and the crew were so helpful and friendly. Scott did an awesome job on my old Nomad. Installed new leaf springs and a cool equa flex / wet bolt suspension system that is sure to provide a smooth ride. Also fixed a few other problems along the way. He kept me informed the whole time they had my rig. I feel totally confident on the road now. Everything was done right, a very good experience!!!! Dustin, Scott & the crew took great care of my trailer. Super patient with insurance hassles and delays. Went above & beyond, rig repairs look great! I'd give 6 stars if I could. Dustin took a lemon and made lemon aid out of our RV. Everyone there took time to explain each step of the process and made sure every step of the repair was completed to the best possible solution. Thank you to him and all of his crew for an excellent job, I am sure we will get many years of enjoyment. Honest, reliable, fair prices, and willing to educate you on how things work! Dustin is extremely knowledgeable, honest, and friendly. I highly recommend California RV Specialists.